Read a sample chapter free online. Samples are also available from Amazon, Smashwords, and Barnes and Noble. "Good night's work, eh?" As he clapped me on the shoulder, I looked at him, wordless. "Hey, don't look like that. A few corpses always helps them think it was an accident." "Bob, I � Insurance is one thing, but this �" I choked, staring out of the office window, down towards the ship. In front of me the hand was still reaching, the arm flailing, but more weakly. I could see the first tongues of flame licking down the sleeve. "What?" He looked at me scornfully. "Don't go soft on me now. Remember, you're in this up to your neck." He turned his back to look at the ship and smiled. He was still smiling when the crowbar hit him, his skull shattering like an egg and he went down. To make sure, I hit him again and from the shape of his head I knew he wouldn't be getting up. He should have remembered what I'd done time for when he recruited me. The boat was still burning, and I knew I had to get across there. I ran out of the dockers' office where we had met, metal burning my hands as I slid down the ladder towards the quayside. The explosives would scuttle her in ten minutes unless they could be removed, placed carefully to look like an explosion as the fuel tanks overheated. With the gangway removed � Bob had said to prevent casualties, now I knew he had lied � getting on board would be difficult. I swung myself onto one of the huge docking chains, pulling myself up. Slick, oil-soaked, the climb was difficult. Twice I slipped, saw my legs dangling over the dark gap between the ship and the quayside where the sea boiled and churned, and then I was against the side of the ship, the raised hull too far above to climb. Locking my legs around the chain I released my grip, fumbling for the grappling hook I had used to get on board earlier. One quick cast and it was over the side, hooked on something. I tugged it as hard as I dared and it moved. Slack pulled in in coils until suddenly the line caught and held. I couldn't see what it was caught on, but it held against my tugs, and carefully, reluctantly I put my weight on it, climbing up until I was standing on the chain. It held. No more delays. Hand over hand I could climb the rope easily, the knots giving me all the purchase I needed. Seconds later I was swinging my legs over the side, and then as I came to my feet, running for the door. Now I was close enough to hear the screams, feel the heat that was beginning to seep through the deck. No time to check the time. I kept running, ducking under the window, feeling the heat of flames on my back and yanking away the fire axe Bob had used to block the door. It came open, and suddenly I was bowled aside as people piled out, desperately escaping the flames. As I came to my feet I was pushed over again, and hands tore at me. For a moment I thought I was being mobbed, and then as I was pulled away across the deck I could see feet kicking at the charred remains of my rucksack. By the side of the ship, I could see crewmen staring at the missing gangway. Others were trying to find something to replace it. Two more had grabbed fire extinguishers and were heading back passed me towards the blaze. Staggering from exertion, I grabbed one. "Guy in the dock office. With a gun. Said he'd scuttle the ship in five minutes. Bombs." I was gasping, sweating in the heat. It was all true, but covered in oil, clothes charred, a total stranger, I couldn't have looked a less believable witness. The man stared for a moment, then yelled to the crew. Fortunately letting them out must have given me some credibility, as they abandoned efforts to extinguish the blaze and turned to escape. A splash over the side indicated a crewman taking a sensible option. Others began to follow. In four minutes this ship was sinking. Anyone close in the water would be pulled under. The rest would be swimming in a sea covered by burning fuel. A shout came from the end of the deck where a crewman had found my abandoned grapple, still trailing over the side. Hauling it up from the tangle of cables where it had caught precariously he was making it fast to the fixings on board and all I could think was there was no god-damn time. I ran back towards the flames. No one tried to stop me; intent on the rope I don't think they even noticed. The crew knew the layout of the ship backwards. I knew something they didn't: the location of the fires. I ran across the deck to the front cargo hold, lifted the inspection hatch that covered the ladder. Sitting on the edge, I swung round, arms on the ladders side, feet to the edges, and began to slide. With a hiss of pain I knew something was wrong even as I started to move, the metal slick in my agonised grasp, but halfway down a ladder it is difficult to stop. My legs jarred across the deck, but I was staring stupidly at my hands. The gloves I'd worn had been light, to allow dexterity and stop fingerprints, not for climbing anchor chains and sliding down ladders. My palms were shredded. I shook myself. No time for this. No time to think, just act. I ran, staggering as the ship lurched, and prayed I still had time. Defusing a bomb, is a complex and dangerous task, unless it's one you built yourself. A quick careful look to make sure Bob hadn't tampered, grip the metal box in the right place and open it, fourth wire from the left, pull, and pray. Nothing, but then since I hadn't needed a countdown I hadn't added one. If I'd pulled the wrong wire I wouldn't be here to worry about it. I picked it up, blood slick on the surface, and ran back. I didn't trust Bob not to have set his own "insurance" and I wanted off this boat, with evidence of my culpability over the side. Back in the hold, snatching at the ladder, I let go with a cry of shock. Trying to grip the heated metal in torn, painful, hands wasn't going to happen. It wasn't a case of forcing myself through the pain, my fingers simply could not close with enough strength to pull me up with both hands, far less one-handed. I stared for a moment, torn between dropping the device here and trying to climb with arms looped behind the ladder, or struggling up with it and risking a jolt that might trigger it. Either way, I knew I'd never make it. The coils of rope hit my shoulder and trailed past, unwinding onto the floor. As I looked up a crewman was gesturing, shouting something I couldn't hear through the full respirator mask that covered his head. His gestures were clear enough. Quickly I wound the rope round my waist, wrapping my forearm in it. If I fell I'd be in trouble, but I wanted out of here. The crewman vanished, and I felt the rope tighten, but I lifted only slowly. What was wrong with them? At this rate we'd still be here when the ship sunk. I crabbed sideways, getting my feet on the ladder's rungs and began to walk upwards, using the rope purely to replace the grip of my damaged hands. Suddenly the climbing became much faster as, with most of the weight off, the crewman could keep the rope taut, providing the support I'd needed. At the top, I leaned forward, over the ladder, and suddenly the crewman had gripped my shoulders and back, heaving me over the edge and onto the deck. I didn't stop to thank him, tottering towards the side of the ship that faced open water. With as much strength as I could exert I threw the bomb. The metal slipped in my fingers, slick with blood, flying off at an odd angle. Luckily there was nothing to hit out there but water. The box made a satisfying splash, and sank. The majority of the device was an incendiary meant to trigger fuel fumes after a small charge punched a hole in the metal of the tank. As long as it wasn't hard against anything when it blew, I wasn't too concerned about it. Bomb already forgotten, I turned to try to get off the ship. There was a sudden thunder and the ship lurched. 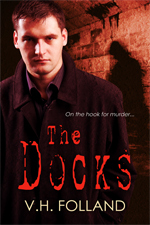 Flung violently against the dockside, the cargo ship's deck slanted sharply and my feet went from under me. A wave of water splashed across the deck, taking my breath away with cold and shock as it hit, and leaving me scrambling to get upright on the now-slick surface. Somehow the damn thing had gone off. I shoved away the list of possible causes running through my head � Bob's tampering, defective materials, a fall-back � and focused on the now. The bomb had gone off when it shouldn't, and now I didn't know what the hell was going to happen next. I had to get off this ship. Staggering on the yawing, pitching deck I headed towards the dockside lights, looking round urgently for a way down. Crewman clustered against the side, clinging to rails and ropes, obviously doing the same thing. I headed for my grappling hook by the anchor � they had to have it secure by now � only to have my arm caught as the ship lurched again, sending me into a group of crewman. I swore at them, trying to jerk my arm free on reflex before what they were saying penetrated and I looked down between ship and dockside where the water churned. Falling into that would be a quick and painful death. Hustled by the crowd I tried to clutch the rail, but my hand slipped leaving a slick red smear across the white paint. Only the pressure of the crowd was keeping me standing, and it was moving, pushing towards a goal I could not see. I had no choice but to go with it until I saw � Thank God! Somehow they'd got the gangplank fixed, held loosely by chains that jerked and rattled as the ship tossed in the crazy waves that filled the harbour. Crewmen were tumbling across it, skidding and slipping to the safety of the deck. Suddenly I had a goal, and began pushing as urgently as any of them. Helped by a shove, I was on the gangway, even as the ship yawed upwards and the surface tilted steeply. I found myself falling, painfully grating my arm against the wire mesh that was all that stopped me falling from the narrow walkway. It tumbled me down the way faster than I could have walked it, arriving at the bottom in a bruised and bloody heap. As the gangplank fell away with the reverse roll of the ship, even as it registered that I was on the dock, safe, I was being pulled away to get other crewmen out. Finally clear of the ship, I stopped to take stock. A body in the office, a bomb in the bay, and both linked to me. I was in trouble.